The Sony DPS-R7 is a digital reverberator equipped entirely with Sony’s digital and audio technology at its highest level of sophistication which was released before with the Digital Reverberator, DRE-2000 and MU-R201 and achieved much appraisal. The Sony DPS-R7 converts the incoming analog signal to a digital signal, passes it through various effects, than re-converts it to an analog signal before output. The determinant to the sound quality is the conversion mechanism that adopts the 18-bit oversampling stereo A/D converter and the pulse D/A converter of 40.96 MHz. These account for highly accurate, less deteriorated effects. The EDIT function allows you to modify the presets or to create some individual effects. Besides the preset memory for a hundred effects. the unit has a so-called user memory where you can save up to 256 effects you are going to create. Using this memory allows more varicolored play of effects. The Sony DPS-R7 consists mainly of a reverberation block together with an input block, a pre-effect block, a post-effect block and an output block for signal processing. For Processing signals with stereo-input/stereo-output in the reverberation block, one of 5 types of ST-ST algorithms is available, while the monaural-input/stereo-output processing allows you to take any two types of MONO-ST algorithm. One of the six types of algorithms can be used in the pre-effect block and one of seven in the post-effect block. By combining these blocks and algorithms used in the blocks, a wide range of effects will be able to be created according to the input source. The remote commander (not supplied) makes it possible to remotely control the Sony DPS-R7. The Sony DPS-R7 has XLR connectors (balanced-type) and phone jacks so that it can be connected to instruments, recording equipment or PA (public address) equipment. The MIDI device incorporated in the Sony DPS-R7 can receive program change signals from another MIDI equipment connected so that the Sony DPS-R7 can be controlled by the MIDI equipment connected. Thus, it can function as an effector when connected to digital instruments. 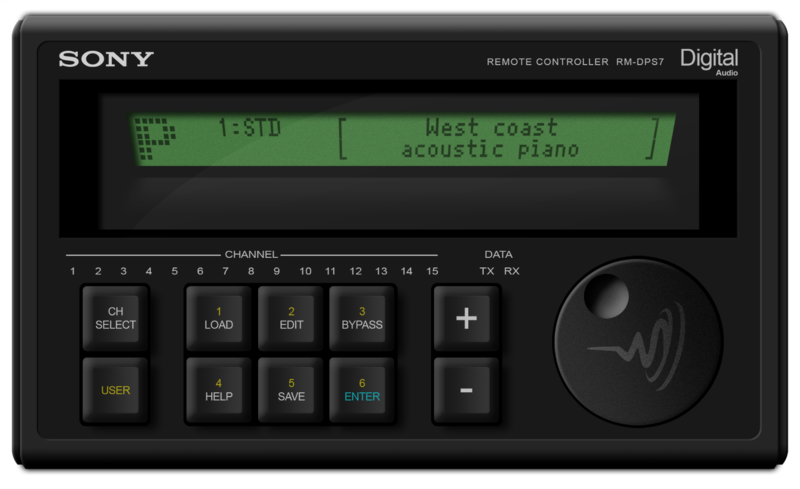 In addition, controls from PC‘s or MIDI sequencers are very helpful for composition.